“I Wanted to Run” is very radio friendly without being too mainstream. It’s a perfect pop song and a great way to open this fabulous CD. The great songs just keep coming. I fell in love with each one as it came on, I kept thinking there’s got to be at least one throw away song in here since that seems to be the case with most CDs I get. But no, they’re all good. Honestly. Douglass’ voice is smooth with an edge and feels like a warm hug. The songwriting is intricate and interesting with just enough hooks to well, “hook” you. I especially like “The Ride” with its beautiful piano playing. But then there’s “Rise” which is hauntingly beautiful. For those of you who like good intelligent beautiful pop music along the lines of Matthew Sweet, Ben Folds and even John Mayer (I love him, OK? 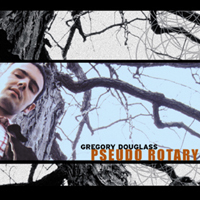 So sue me) you owe it to yourself to pick up Gregory Douglass’ “Pseudo-Rotary” and why not grab his previous release, “Teeter” while you’re at it?